Occupying 165 acres of former grazing marshes, Minehead was the largest of the postwar camps to be built. Construction took place over the winter of 1961 and the camp opened its doors on 26th May 1962 after an investment of around £2 million. The site was chosen after Billy Butlin had conducted an aerial survey of southwest England. The large, flat area, close to the town and sea and served by good rail links, was considered the ideal site for the latest Butlin's addition. To help combat problems with flooding, a trench was dug around the perimeter of the camp and the earth used as a barrier - the trench then became the boating lake. The miniature railway was added in 1964, the chairlifts in 1965 and the monorail in 1967. The latter ran on 800 yards of track and formed a figure-of-eight layout, looping round both the Princess and Regency buildings and crossing over itself above the outdoor swimming pool. In 1981 the camp received an investment of £1.2 million and in 1986 it was selected as the first Butlin's site to undergo a major renovation as part of the late 1980s investment programme. 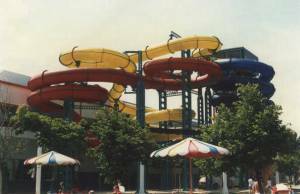 £10 million was spent on renovations and this included refurbishing the old indoor pool complete with flumes, rapids and whirlpools. 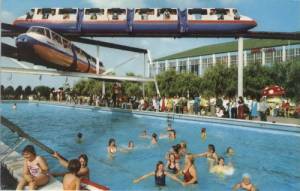 Further investment occurred in the 1990s and is now one of only three Butlin's sites remaining. In 1998/9, 139 million was spent on the three remaining camps with Minehead receiving completely refurbished accomodation, a new swimming pool and notably a Skyline Pavillion which houses much of Butlins' entertainment. Since the rennovation in 1998/9, the resort has undergone several changes, notably the removal of the old Beachcomber Building and the addition of "Blueskies" - 24 luxury holiday club apartments. The camp is still as popular as ever and plays a vital role in the local economy. It has 9,200 beds and plays host to nearly 400,000 holidaymakers each year with another 80,000 coming as day visitors. It employs 200 full-time and 1,400 seasonal staff. It's been said that if the camp ever closed the unemployment rate in Minehead would triple! It's also been said that when the camp is full the population of the town is doubled.